Newswire #88 – 16th Sept. 2016. Your latest news direct from Anime Limited HQ on AllTheAnime and Funimation titles coming to the UK. It’s the end of the week and that means it’s time for your latest edition of the Newswire. This week we bring you details of our forthcoming Eden of the East TV Series Ltd Collector’s Edition set – and there’s a special limited-time offer going on for this at our web shop too, updates on MCM Scotland Comic Con, Your Name in the cinema and more! Read on below for details. ~ First of all the wait is nearly over! This Monday (19/9/2016) sees the release of Samurai Flamenco Part 2 Ltd Collector’s Edition Blu-ray set and the first-ever complete series release of Beck: Mongolian Chop Squad on DVD. In case you missed it earlier in the week you can see a full unboxing of Samurai Flamenco Part 2 HERE. If you haven’t seen it before, check out the trailer for Beck: Mongolian Chop Squad below. ~ Right, we’ve got a few date changes to tell you about. First of, the Blu-ray version specifically of Assassination Classroom Season 1 Part 2 has had to be delayed due to a replication error. We haven’t got a new date for the Blu-ray confirmed but as soon as we have more info we’ll share it with you ASAP. However, to reiterate this is impacting the Blu-ray version only. The DVD version is still going to be released as planned on 28th September. ~ Also, Free! -Eternal Summer- has had to be shifted by back one week and is now set for release on 3rd October. Delay in delivery of stock being the cause for this. ~ Don’t forget that 28th September also sees the release of Project Itoh: The Empire of Corpses! You can expect an unboxing of release next week! If you’re interested in ordering this (at time of writing) Amazon.co.uk have it listed for only £19.99. Order your copy HERE. 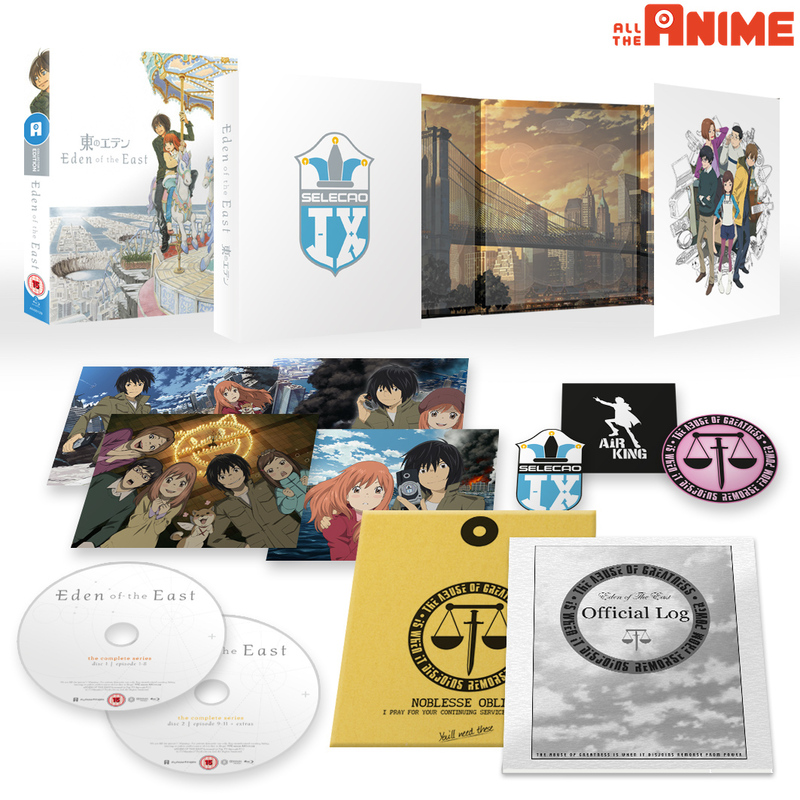 ~ Looking ahead, we know a lot of you have been wondering when we planned for our release of the TV series of Eden of the East and today we can reveal what you can expect from our release Limited Collector’s Edition Blu-ray set. Event Map showing the location of various events from the series, Background Art that also features comments about the art themselves from those who worked on the series. Team Discussions is a very unique read as it features those who worked on the show discussing certain subjects. There’s the Opening Image Director Masanori Yamaguchi and Ending Image Director Shoichi Haruyama discussing their experiences working on these and the friendly rivalry between them. And there’s also Rohei Kimura (the voice of Takizawa) talking to Director Kenji Kamiyama about the origins of the character he voiced in the series. The Anatomy of the Noblesse Mobile is, as they describe it in the book, a dissection of the key item from the series. From it’s functions, to colour variations, specs and more, it’s genuinely fascinating how much detail they went into in this section. And as if that wasn’t enough, there’s even an interview with Kenji Kamiyama that acts as a continuation to the experience after you’ve watched the series. It’s a loaded book, and did we mentioned there’s also over 90 minutes of on-disc extras in addition to the main series (11 episodes) itself? These include interviews with Director Kamiyama & Original Character Designer Umino, Kimura & Hayami (the voices of Takizawa and Saki respectively), Directors Kamiyama and Oshii, Art Director Takeda and Composer Kawai. Now that I’ve described what’s included you’re probably wanting to see what it’s going to look like, right? Well here you go. In terms of release date, we’re still locking in the details but expect it to arrive in November with a final date to be confirmed in the coming weeks. You can watch the trailer for TV Series of Eden of the East from our YouTube channel below. And if you haven’t already, check out our exclusive trailer for this release below! ~ It’s hard to believe but we are just over a week away from MCM Scotland Comic Con in Glasgow! You can read the details on what we’ll be doing at the event, including panels and such, in the UPCOMING EVENTS section below. ~ First of all, in case you missed the announcement of us having acquired Your Name in the United Kingdom & Ireland, and the the fact it will be in cinemas from 24th November, CLICK HERE TO READ THIS. ~ We can confirm that Your Name has received a BBFC rating of 12A. ~ As we mention in the link above, your first opportunity to catch the film on the big screen will be as part of the BFI London Film Festival and tickets are selling VERY well for this. (At time of writing) one of the screening has sold out with the others catching up very quickly. if you’re wanting to catch the film at London Film Festival we strongly suggest booking your tickets sooner rather than later. Book your tickets HERE. ~ Don’t forget that Your Name will be getting screened at 78 locations across UK & Ireland from 24th November. We’re delighted with so many of you wanting to catch the film on the big screen. You can book your tickets today at YourNameTheMovie.co.uk and includes all the locations it will be screened at too! ~ This week our update is in reference to Gonna Be The Twin-Tail!!. Unfortunately due to a delay in delivery of stock this is having to be pushed back a few weeks once again. We’re very sorry for this but this is a circumstance beyond our control. The new release date for this is 10th October. ~ Tickets are on sale for all screenings at Scotland Loves Anime in Glasgow and Edinburgh! You can go to LovesAnimation.com for all the details. Our next event will be at the end of September and then we move into the Scotland Loves Anime Film Festival. – Autograph Signing Sessions with Reo Kuruso will be on Saturday at 15:30 and Sunday at 12:00 in the MCM Signing Area. You can bring an item to get signed, or there will be a signing card present to get signed and best of all, this signing is free of charge! Likewise for The Empire of Corpses.